The 2014 Eastern American Cricket Association season opened with much fanfare across various venues from Van Cortland in the Bronx, Queens and even Long Island. At Flushing Meadow Park NY Centurions hosted Arsenal CC. Initially the match was delayed by 40 minutes due to another match which had started earlier. Arsenal won the toss inserting NY Centurions. A steady start between opening Chris Ragunauth and former USA youth player Trevor Singh saw NY Centurions claiming the initial proceedings. Gazi Rehman got one to swing with Singh playing down the wrong line, bowled for 13, 26/1. NY Centurions responded well with Deoraj Sewnanan combining with Ragunauth as the pair added a vital 42 runs for the second wicket. Ragunauth who had benefited from a chance earlier was not as fortunate the second time of asking as Moon Chowdhury scooped up a one-handed spectacular to make amends for spilling the dolly. Rehan Shahid one (1) Ragunauth gone for 24, 68/2. With the score at 84/2 after 10 overs the Centurions seemed to be cruising. Enter Shahid, a leg spinner not Afridi, but Rehan Shahid. Sewnanan bowled for 12, 84/3 (10.1). The very next delivery Shaquille Williams was caught and bowled, Shahid on a hattrick 84/4. Carlton Barker did survive the hattrick ball and then two more only, to hold out to Chowdhury 84/5 after 11 over. It was all pedestrian pace from there on as NY Centurions showed no resolve. Skipper Vicky Persaud tried to hold his side together but it was asking too much of the youthful lower order. Shahid scalped three more as NY Centurions succumbed to 121 all out off 21.2 overs. Carlos Bachu drew first blood as he bowled Shehzad Iqbal. Arsenal Skipper Mustafa Moiz and veteran Abid Hamdani combined to consolidate the top order. NY Centurions felt a glimmer of hope when S. Williams bowled Moiz (22) with his first delivery. William would be disappointed as two catches went down off his bowling typically sealed the Centurions’ faith. Williams (2/25) bowled Hasib Ahmed with Hamdani steady at the end. Bachu (2/28) returned to trap Hamdani leg before for 31. With Barker notching a scalp of his own bowling Himalay Patel. Chowdhury and Rehman made light work of what was left of the chase as Arsenal opened the season with a convincing five wicket win with 14.4 overs to spare. In other scores Eastside Warriors edged Enmore by three (3) runs. Eastside scored 215 with Mahendra Seeram 2/21. Enmore left it late, Safraz Alli 68 and Mark Gomes 27. Eastside held their nerve to open the season with a narrow victory. 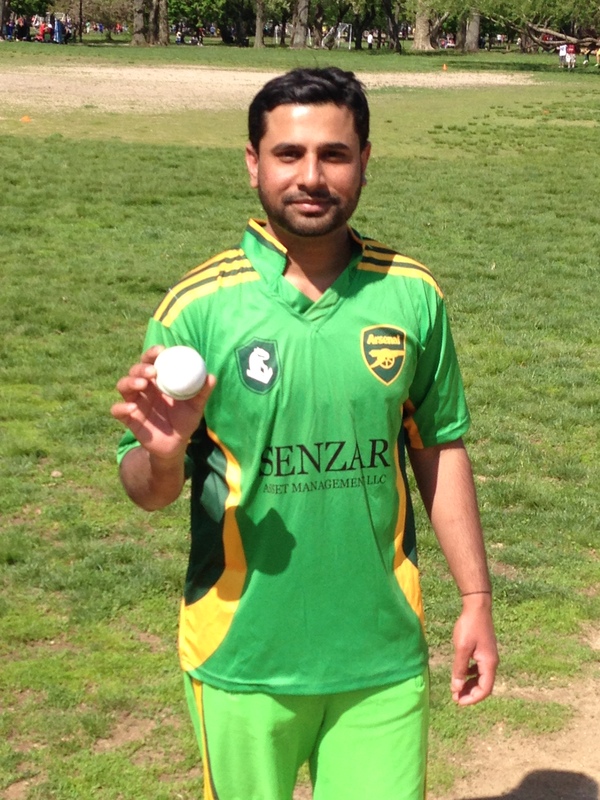 This entry was posted in Dyon Ravello, Eastern American Cricket Association, Match Day and tagged Arsenal CC, EACA 2014 Power 40, Eastside Warriors, Enmore, NY Centurions, Rehan Shahid, Safraz Alli. Bookmark the permalink.